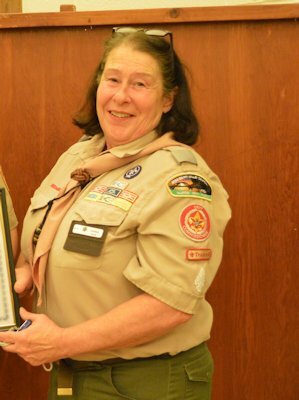 Donna Buss of RR Media is the recipient of the American Boy Scouts Lifetime Achievement Award for her Outstanding dedication to Scouting. Gale Lofgren presenter of the award gave the following remarks before the presentation: "The lifetime achievement award is going to a person who has been active in Scouting in many positions for many years. "A few of these positions include work with packs, troops and crews: service on Cub Scout Resident camp staff in several positions. "She has served as unit commissioner, Cub Scout Roundtable Commissioner, Assistant District Commissioner, District Commissioner and is currently serving as out Council Commissioner. She always has a positive attitude and looks for solutions to problems, rather than creating problems."